The title to this post pretty much says it all. As alluded to in the discussion thread of an earlier post, if you use an informative prior probability distribution in which the mean is too low - then the result can (especially in the limiting case as the mean goes to zero) become the parsimony reconstruction. That is, as our prior probability distribution forces our posterior distribution of Q to be closer & closer to zero, all reconstructions converge to the one or multiple most parsimonious reconstructions. Here's a quick demonstration of what I mean. Just to make the point clear, I have used a very exaggerated bad prior probability density - the γ with α = 2 & β = 200 - which basically says we have a high degree of confidence that the rate of evolution is very low (with mean α/β = 0.01). > # now a prior that is way too low! What's dangerous about the reconstructions shown above is that (without the known true history, as in this case) it may be the rightmost reconstruction - the one obtained with the faulty prior - that looks most reasonable! So I've been playing around with this again, and I'm comparing the results obtained using the empirical bayesian approach and the full MCMC approach. I'm kinda surprised that the results are so different, and wondering if this is expected. My tree has 47 tips, 7 have state 0 and 40 state 1. 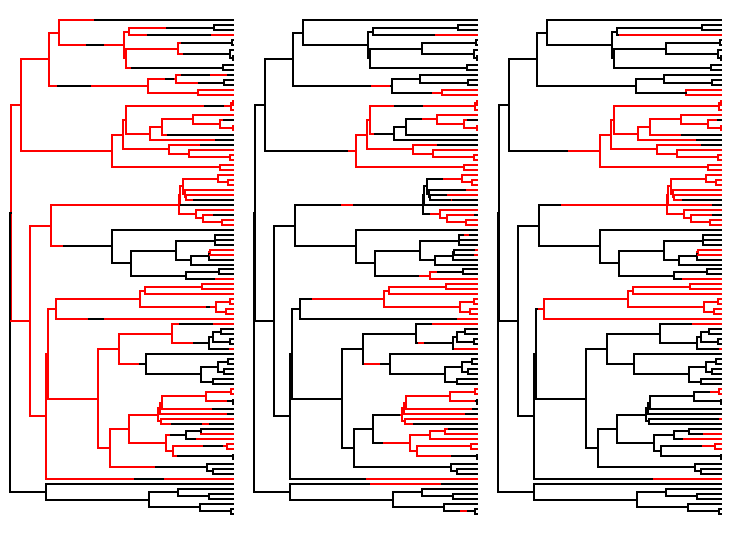 The seven tips with state 0 are quite sparsely distributed throughout the phylogeny. I'm kinda surprised there is an about tenfold difference in the estimated transitions between the characters. Of course intuitively it feels that less transitions make more sense, but as you explore in this post, that needn't be the case. But the difference between the transition matrices is quite huge too. Is it because the default priors might not be reasonable for this case? Thanks for any help, cheers!